In a June 3rd, 2018 Tweet, John McAfee announced his intention to run for President of the United States (POTUS) under the Libertarian Party and even indicated his willingness to launch his own political party if needed. 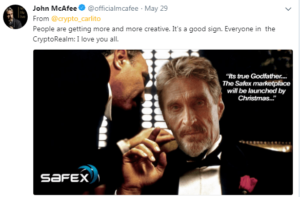 Are there any other indicators that Mr. McAfee intends to follow through with a 2020 Presidential bid? The answer is yes. 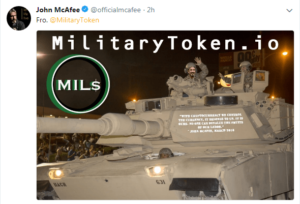 Just one day after publishing the Declaration of Currency Independence, Mr. McAfee once again took to Twitter for an important announcement. This time, John McAfee announced the coming McAfee backed currency called the McAfee Redemption Unit. It is named after the commodity it represents which is an in person meeting directly with John McAfee himself. The concept is the bearer has the right to meet with John if the bearer would like to cash in the currency. The third significant indicator that John McAfee does intend to run for President of the United Sates is that he has made a dramatic shift in attitudes toward cryptocurrency projects stating “Everyone in the CryptoRealm: I love you all.” He then began Tweeting memes that he was impressed by but that also promoted projects from several different coins following up on his intentions of bringing the crypto community together. 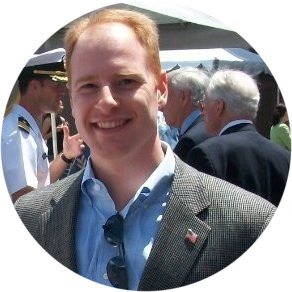 The memes included projects such as Safex, BitcoinPrivate, MilitaryToken, and even Litcoin. 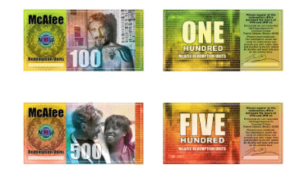 John McAfee has declared his intention to run for President of the United States, has published a Declaration of Currency Independence, has announced his plans to issue his own currency, and is calling on the cryptocurrency community to rally to the cause. These actions appear to be strategic in nature and all point to the likelihood that Mr. McAfee has in fact launched his efforts to become a leader for many.